Grind soaked Almonds into paste. Grind soaked Moong Daal into paste. Heat sugar and water to boiling level and add cardamom powder. Stir the mixture till it turns little thick and add half almonds paste to the sugar mixture / chashni. Now heat Butter / Ghee in a non stick deep dish pan on a medium heat. Add slowly all Moong Paste into the pan and stir it continuously till you can start smelling from other room or till it starts leaving oil in sides. When Moong turns little orangish brown add half almonds paste to it and stir it. Now add cashew nuts and raisins. After 2-5 minutes when the mixture turns fully cooked add sugar mixture to the moong daal paste. Stir it continuously till it turns thick and all water is evaporated. Serve hot or cold with grated almonds garnished. Note :- Mung bean, also known as green bean, mung, moong, mash bean, munggo or monggo, green gram, golden gram, and green soy, is the seed of Vigna radiata which is native to India and Pakistan. 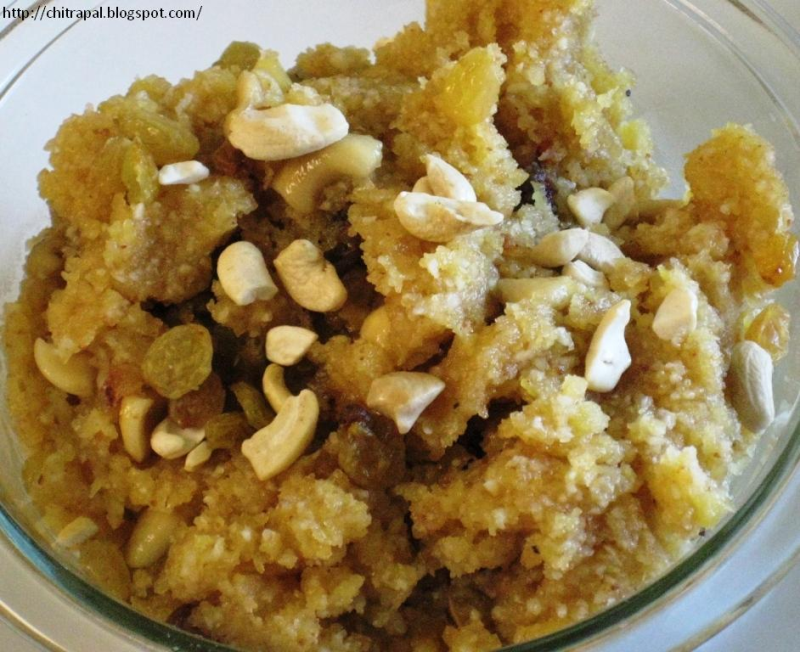 Hi Chitraji,ur moong halwa recipe seems quite interesting n delicious too....thanx for it. Hi Chitra If i want it make it without badam paste, cashew and raisines how do i make it. Because i stay in carribean islands (U.S. Virgin Islands) we do not get khoya as well. So please suggest me something. Thank you. Vanshika.